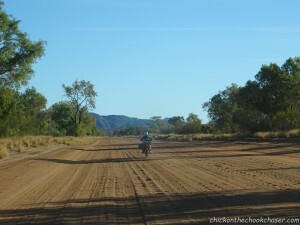 So when people say they traveled straight through the middle of Australia they usually mean from Adelaide to Darwin. However when I decide to travel straight through the middle of Australia I take the road less travelled, from Brisbane to Perth. On this route there are less people. Also, there are less fuel stations and less roads, especially less sealed roads. To my surprise, and a bit to my relieve too, I found another crazy Dutch girl, Lisette, to share this part of the trip with. 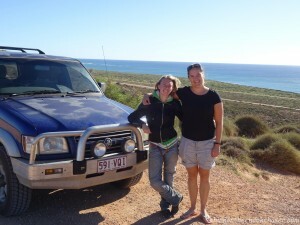 Lisette bought her very first car, a Holden Jackeroo 4×4 nick-named Jack, just two weeks before we set off on the trip. 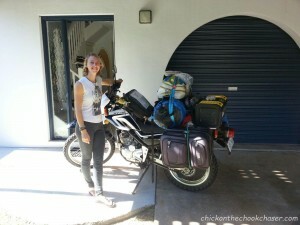 After working and living in one place for almost 4 months I was eager to get on the road again. 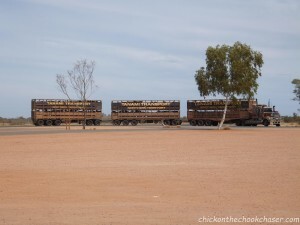 The chook chaser was dressed up with a new rack and trolley bags for panniers. It was fully loaded, including 10 litres of water in the tank bag and an extra blanket anticipating cold nights in Alice Springs in July. Whe n Lisette saw me arrive on the contraption that used to be my motor bike her eyes nearly popped out of her head. Having found her cool again we were both ready to set off. Navigating out of Brisbane we have our first, and only, near accident. The middle of a row of three traffic lights was red, but trying to find our way out of the city we both missed it until we were right underneath. Both of us hit the brakes and with a skidding rear wheel I only just manage to avoid Jack’s spare wheel. 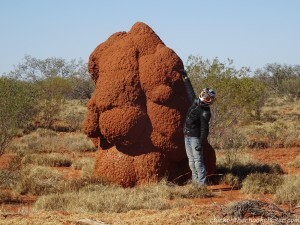 Who says the outback is dangerous? The city has proven much more of a challenge! selves from what is commonly known as civilisation. 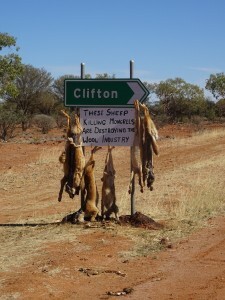 The towns became more widespread, the roads narrower and the kangaroos more plentiful. The early appearance of these jumping creatures forced us to get off the road quickly and find a camp spot. An open grassy area next to a seemingly unused train line was called home for the night. ll I could think of was whether the bike was ok. Sitting on the side of the road recovering from the shock a group of guys travelling to the Finke Dessert Race in Alice Springs passed on their motorbikes. They checked the chook chaser and assured me all was fine. 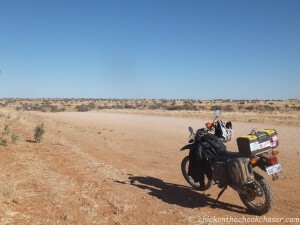 Trembling and shaking I got back on the bike again and we made it to our next stop in Boulia only as the sun was setting. The next day we left Boulia early and started our journey to Alice Springs, we took the Donohue and Plenty highways to cover the 806 km of gravel separating us from Alice Springs. It took us another 2 full days to reach the city in the middle of the continent. Two days of dust, gravel, anthills big enough to live in, no nonsense statements about foxes, occasional passing traffic and amazing outback skies. Simply said we were on the trip of a lifetime. Thanks for the pictures Lisette!